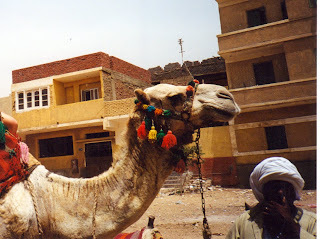 We were in Cairo in 1998, for just a few days. We flew in from Athens at night, and as we approached Cairo the city lights went on forever. Cairo is the largest city in Africa, with over 6 million people, and another 10 million on the outskirts. 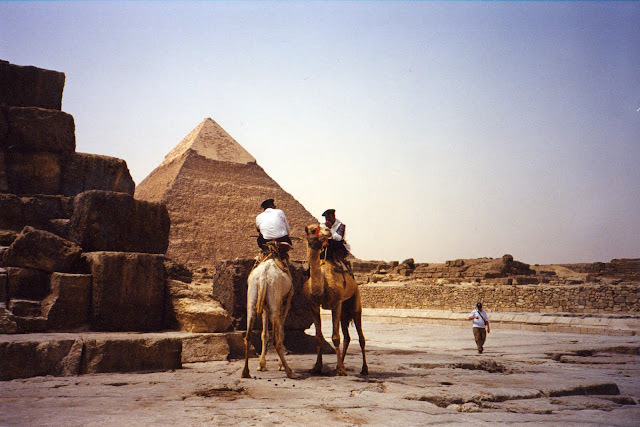 From the Pyramids at Cheops we could see the Cairo skyline. 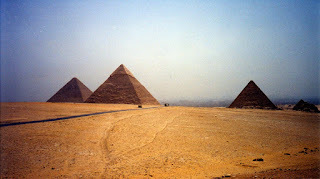 At that time only the Second Pyramid (Giza) was open for internal viewing. The entrance doorway to the Pyramid was short and narrow. We walked single file, bent over through the long dark narrow passage. The corridor ended in a rectangular cement-like room with a bit of old graffiti on the wall and one sarcophagus in the centre. So old, so amazing. 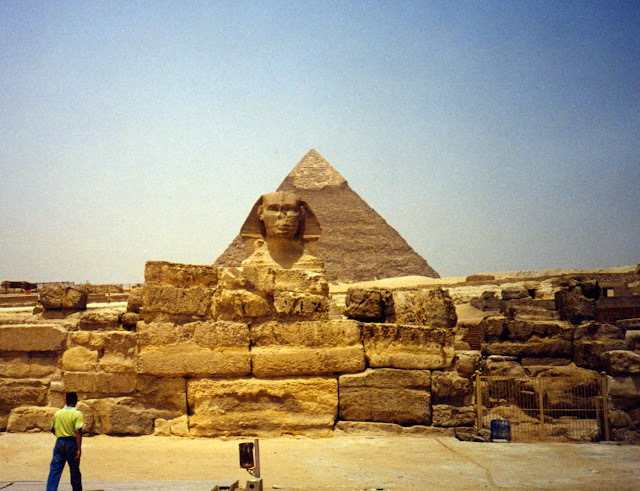 We walked around the grounds in the blazing hot sun and had our pictures taken in front of the Sphinx. All in all, pretty spectacular. Next day we went to the Museum of Egyptian Antiquities. It was jam packed like an overstuffed garage with impressive artefacts, giant statues of Pharoahs, furniture, coins, jewellery - all from Ancient Egypt, the largest collection in the world. We met our tour guide, Moses, outside the museum. “Moses coming through “ he announced as he led us around the famous sights of the museum, barging ahead of tour groups. Moses was full of fantastic facts. Did you know that one drop of lotus oil on the forehead of an 80 year old woman made her look like a teenager again? Similar claims for men. The pitch to buy perfumes came after the tour. We enjoyed the entire experience. At the Egyptian Museum we also viewed the contents of King Tut’s burial tomb, over 3500 items. 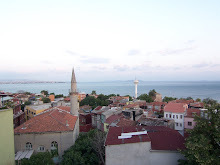 So many things for life in the here and now, and in the afterlife. Chairs of every size for the growing king, boats for the journey to the netherworld, ritual jewelry and gold. King Tut was 19 years old when he died, probably of an infected leg wound. DNA testing has also revealed that he had malaria. And then on to the Royal Mummies Hall. This was eerie, just as much from the stern armed guards, as from the Royal Mummies laid out around the room. Quiet! Everyone spoke, by order, in hushed tones, out of respect for the dead. This was thrilling, especially for the kids. 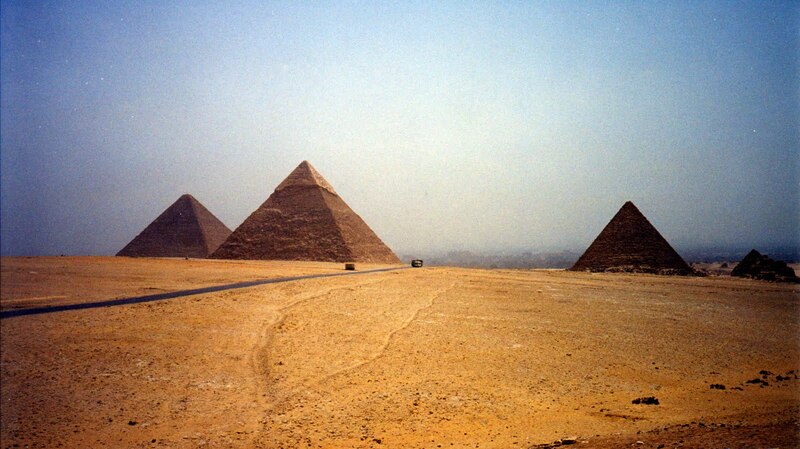 The Pyramids and the Egyptian Museum are sights every traveller longs to see. Inspiring, fascinating, perplexing.